Agree with each other, love each other, be deep-spirited friends. Don’t push your way to the front; don’t sweet-talk your way to the top. Put yourself aside, and help others get ahead. Don’t be obsessed with getting your own advantage. Forget yourselves long enough to lend a helping hand. Living in community can be rough at times. And God knew this. These verses on their own capture how to help make successful community. Putting one another’s needs ahead of ours, seeking agreement, helping others fulfill their dreams, actively loving one another. But these verses, although they contain the action steps we are to take for healthy, united community, don’t explain the why. The first verse of Phillipians 2 does. Because of what God has given us, His love. Because of the family we are now a part of, His. Because He is awakening in us a care for others from His heart. 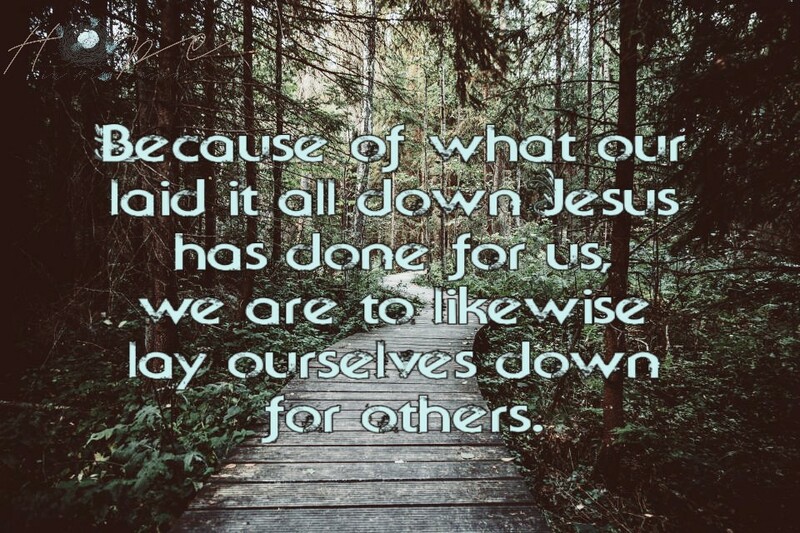 Because of what our laid it all down Jesus has done for us, we are to likewise lay ourselves down for others. There are times when we can pick verses out of the Word, examine them closely and still miss the point, if we aren’t allowing Holy Spirit to heighten our awareness of what wisdom He wants us to learn when we study it. The Bible isn’t just a collection of writings spanning hundreds of years and dozens of authors. It is a living Word. God Himself inspired it through listening hearts. God Himself collected it through willing hands. God Himself is contained within it, and knows what we need to be fed each time we pick it up and invited Him to do so. For we are not just in community with people, but with God Himself! May He deepen your awareness of how to live a life of community which blesses Him, those around you and yourself as you follow His lead. Love this and love your style and message and The Message and look and glad we are neighbors late in the morning (in CA) on Intentional Tuesday. My fav line: God Himself is contained within it, and knows what we need to be fed each time we pick it up and invited Him to do so. I’m happy to tweet and share this, too. God is all aboaut the invitation – I need to invite Him to speak to me everytime I come to Him praying and reading and prepping for the next thing. Thank you for your words today. sue@welcomeheart.